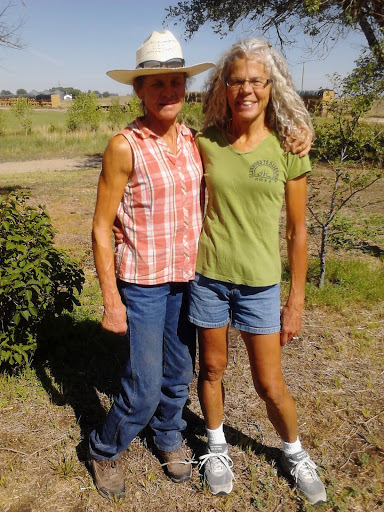 Words and pictures fail to describe all that we observed these past 5 days while visiting my sister, Sande, on her ranch in Torrington, Wyoming. 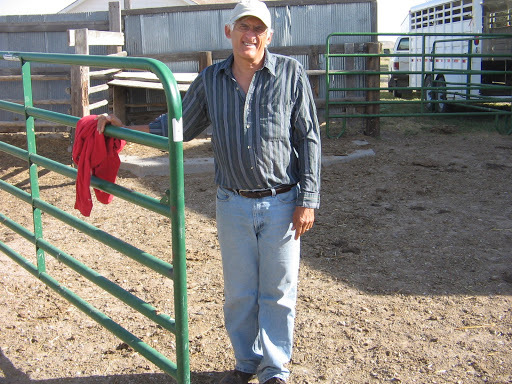 The amount of work that is necessary to make a living on a ranch is overwhelming. We tried to come up with a list of categories for everything she is involved in that contributes to her daily workload. 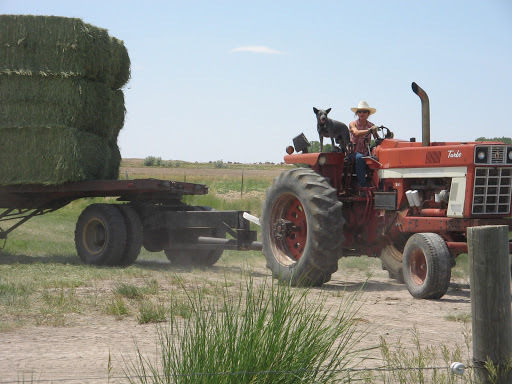 That list (I’m sure we forgot some) includes: haying, beef cattle, dairy cows, housekeeping, cooking, cheese making, poultry, business management, calving, branding, fencing, irrigation, vehicle and machinery upkeep, gardening and rattlesnake killing. Raising two bottle calves, that have to be fed 3 times a day. Straining the milk sold as fresh milk or made into cheese. Heading out with 3-wheeler to check hay fields. 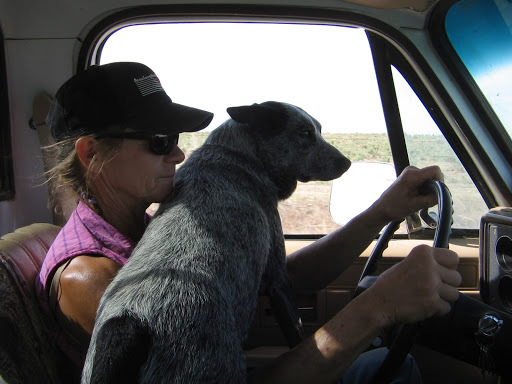 Boone, faithful dog, rides everywhere with her and helps with herding the cattle. 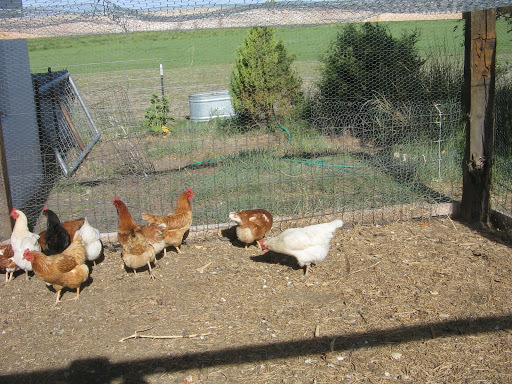 Eleven chickens, let out of their pen each afternoon, for “free range” time. 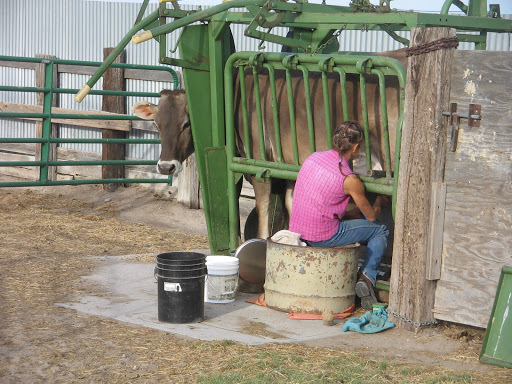 Candy, the dairy cow, needs to be milked twice daily and then given feed and water. 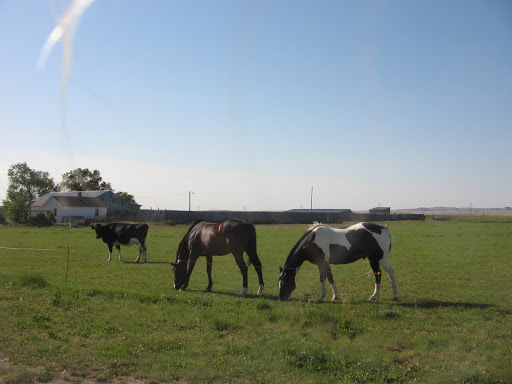 Didn’t get a photo, but 2 horses and several cows and calves stay in the barnyard area and have to be fed twice a day, also. This doesn’t count driving the tractor out into the fields to bring hay to the main herd (80 cows with their calves). This task is necessary because the drought conditions have meant there is not enough grass for grazing. Feed and water for Candy. 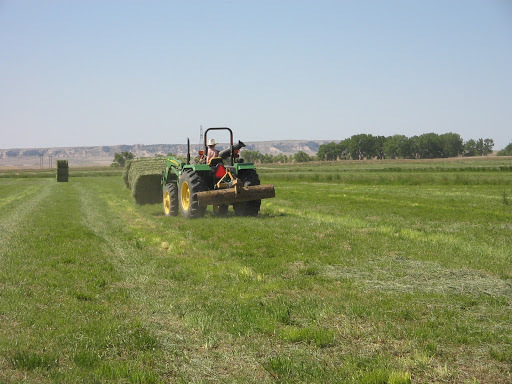 The week that we were on the ranch the task of putting up the first cutting of hay had already started. 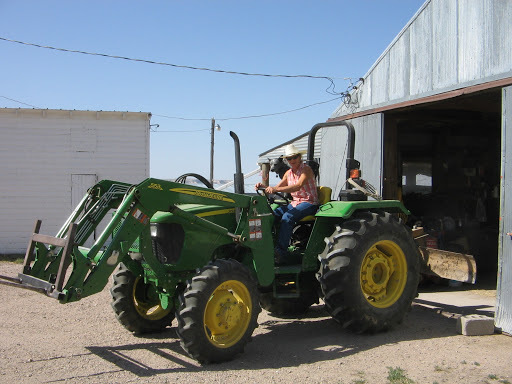 Sande hires local ranchers who have the proper equipment and then prays like crazy that the weather cooperates. This year the weather wasn’t too cooperative. 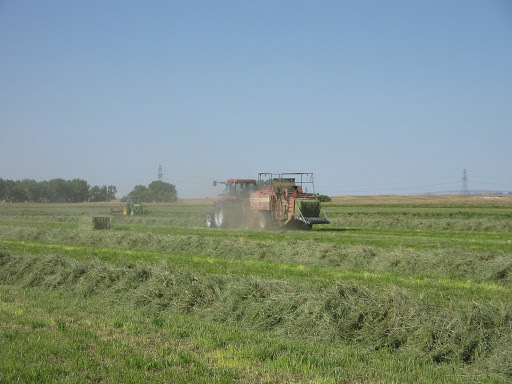 The hay had been cut and was drying in the fields until Wednesday morning when the men with the rake and baler showed up to begin baling the hay. Sande assisted by using her forklift to pick up the bales and organize them into piles of three. This made it less time consuming to get the bales off the field and put onto the storage stack near the farmyard. The man who had been hired for that task showed up with his tractor, loader and wagon later in the afternoon. 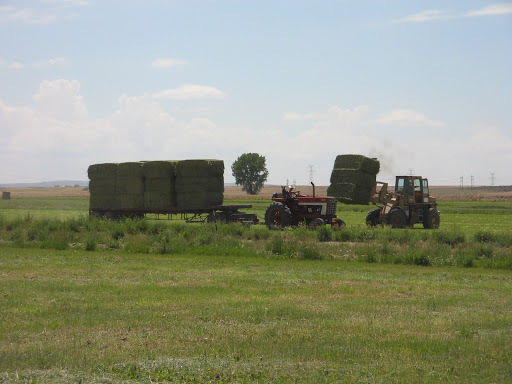 He and Sande worked so efficiently that they were almost caught up with the raker and baler when the storms hit. It was amazing how fast the storm clouds built up. When the rain and hail began in earnest the haying had to be abandoned as everyone ran for shelter. 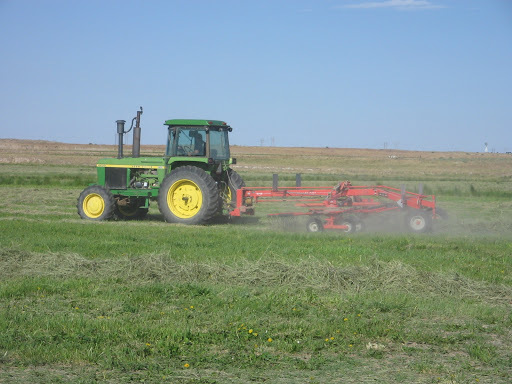 The hay crop was small because of the drought and some of what was cut will be ruined after everything has dried out and the haying resumes. But most of what was cut down this week was brought in and stacked before the rain and Sande was thankful for the hay that she did get. Hopefully, second and third cuttings later this summer will yield more. 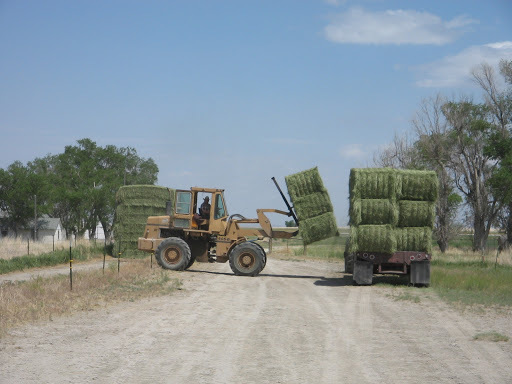 Heading out to begin stacking the hay. Sande and Boone working on making stacks of three. Are you wondering if Lee and I did anything useful while we were there? 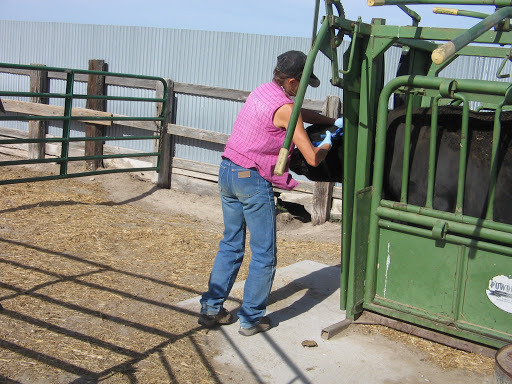 Well, the day before the haying started Sande said that we could help with the task of getting one of her young bulls moved from its pen in the farmyard out into the field where it could be with a group of her cows who were ready for breeding. We would get the bull corralled first and then she would load it into her horse trailer and drive it to the field. Lee came prepared with his red shirt for the bull herding task. Sande did most of the “herding” and we just yelled and waved our hands or closed gates after it went through. 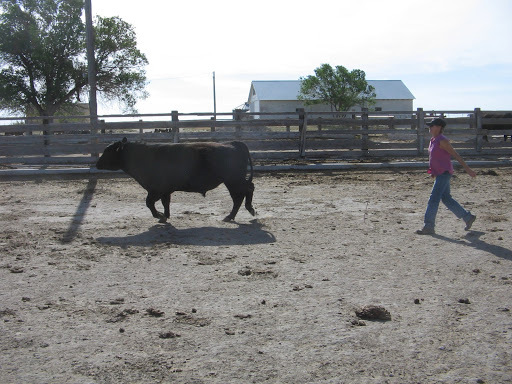 Giving the bull its tag before it gets loaded into the trailer. After the bull was unloaded in the field there was a water tank in an adjacent field that needed to be brought back to the farmyard. 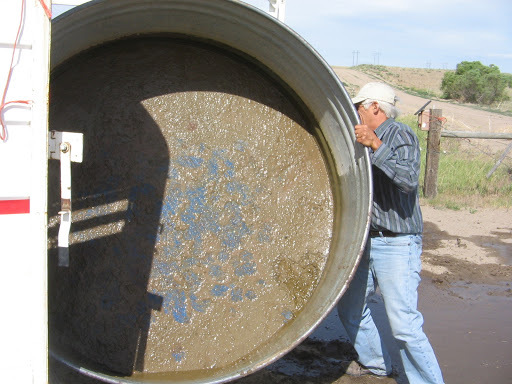 Using the now empty horse trailer, Lee helped Sande drain the tank and roll it into the trailer. 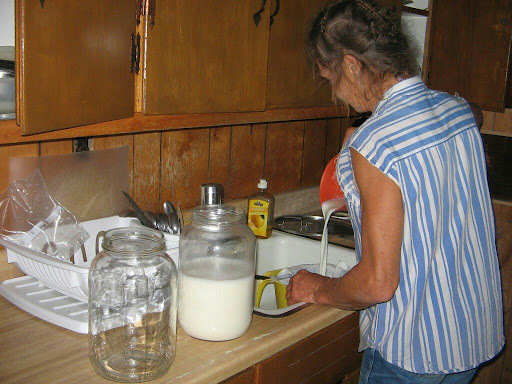 We also helped with the cooking and housework whenever we could. One of my favorite tasks was to let the chickens out of their pen each day and then go into the hen house and gather the eggs. Lee’s favorite part of that task was to eat one of those farm fresh eggs every morning with his breakfast. Although calving season on the ranch had ended over a month ago there was one late cow that had not yet had its calf. After the rain and hail that made a muddy mess out of the barnyard, the late cow decided on Thursday morning that it was time for her to give birth. 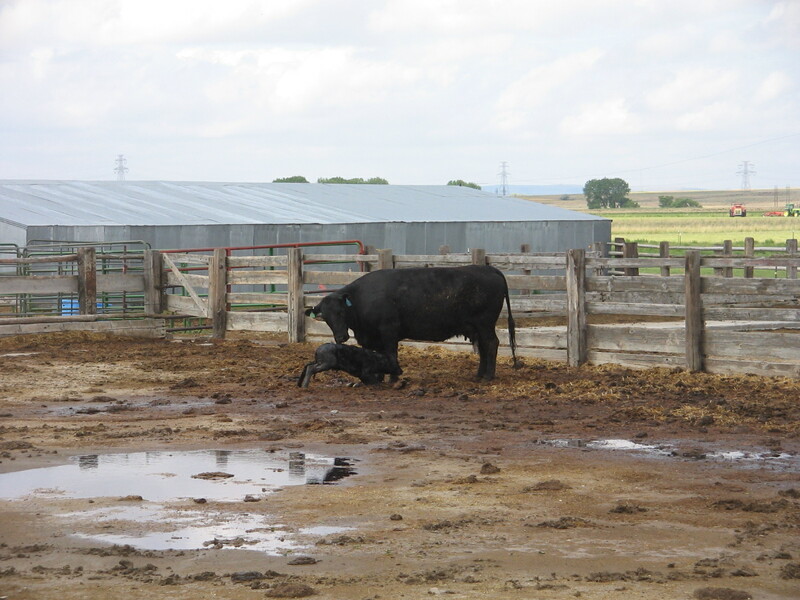 Fortunately, the calf was able to get up on its shaky legs in spite of the mud and found the nourishing mother’s milk so necessary for its survival. 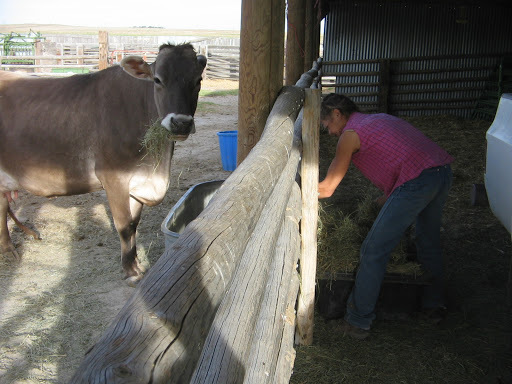 As quickly as she could, Sande made a pen in the shed for the cow and calf and brought them into shelter. Newborn calf, that in a matter of 15 minutes, was up and nursing its mother. It was hard to say goodbye today to Sande, but we are so thankful for the time that we were able to spend with her. 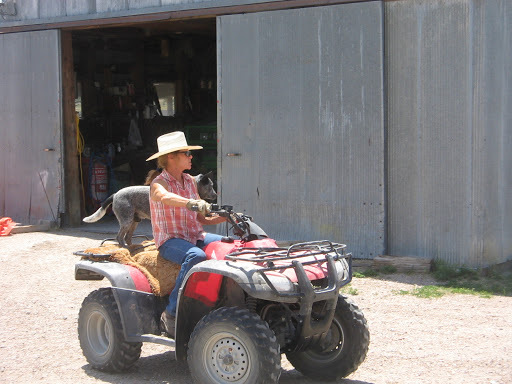 Please join us in praying for her health, strength and safety as she lives this ranching life she loves. We are on our way now to Boulder, Colorado, where we will spend the weekend with some friends at their cabin near Rocky Mountain National Park. WOW! What a story. I am eager to hear more about Sandee and the ranch. Had no idea it was such an extensive operation. 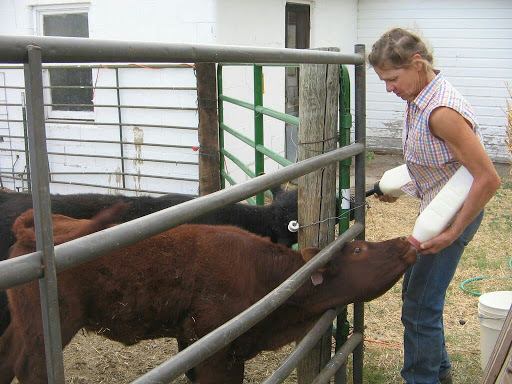 TY for sharing the new- born-calf and bull-corralling story. Hope you have't hit any of that rotten Colorado weather.